World 5-1 is the first level of World 5 in Super Mario 3D Land. 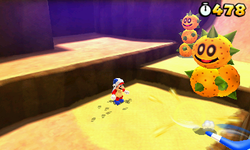 The level is a desert-based area, which introduces the power-up form of Boomerang Mario. This is the first and only canyon level of the game. Mario starts in the canyon, where a Boomerang Flower is found. Ahead, there are three cacti and two Pokeys. These foes are guarding an inclined area that leads to a more elevated place of the cliff, where Mario finds a Boomerang Bro and a pit with four stone Donut Blocks. Crossing this pit, he faces Tail Goombas in a stair-like carved stone. Behind it, there is a P Switch that creates a line of notes when pressed. After the stone, Mario must cross a narrow tilting board. On the other side, there are two Tail Thwomps and Sandmaarghs that guard a Door. It leads to an underground area, where Mario can get the Checkpoint Flag and, soon, go up on a sandy octagon-shaped platform that rises. During this route, he faces a Boomerang Bro, Spiked Balls, Sandmaarghs and Giant Spiked Balls. When the platform reaches on the top, returning to the outdoors, Mario must pass through four Pokeys until he reaches a Cannon, which he can use to aim at a Coin Ring and grab the top of the Goal Pole. Star Medal 1: Upon entering the level, there are several Pokeys near a ledge with unstable rock platforms above. Hopping on the ledge, the player should head left into a hidden Warp Pipe, which takes the player to the first Star Medal. Star Medal 2: The player should hop onto one of the Tail Thwomps at the top of the cliff to reach the Star Medal. Star Medal 3: While on the moving platform directly after the checkpoint, the player should acquire a Boomerang Flower from a nearby Boomerang Bro. After a while, the final Star Medal appears and must be grabbed using the boomerang.